Do you have a favorite project with which you are completely satisfied? This size 3 bishop dress is one of only a few that fall in that category for me. It was a pleasure to make and if I were to do it again, I wouldn’t change a thing. Made of cotton batiste, the dress and shoulder ruffle are blue while the neck binding, sleeves and Madeira applique’ hem are champagne colored. The smocked sleeves and shoulder ruffle are trimmed with champagne French lace. Pin stitch, feather stitch, and machine embroidered flowerettes further embellish the sleeves, shoulder ruffle and hem. Initially made for a little friend to wear to a wedding, the dress has had more lives than a lucky cat. In its first life at the wedding, the dress was stained with chocolate covered strawberries. This child loved them. There was chocolate alllll over the front and strawberry juice everywhere there was no chocolate. It was a mess. But with my stain stick and Wisk, it came clean. Next it was modeled at the Brother dealer convention in Denver. After that, it was featured in ads for Brother’s ULT series (2001, 2002D, 2003D). Following that, it appeared on the cover of the instruction manuals for those machines, along with my gingham dog and calico cat quilt. Every stitch of this dress, except for the hand smocking, was sewn on Brother’s top-of-the-line machine. The little frock showcases the flawless execution of machine’s heirloom stitches and delicate machine embroidery. Pinstitching along the Madeira applique’ hem and joining the lace to the sleeve and shoulder ruffle was flawless. Delicate feather stitching echoes the pinstitch. The machine embroidered flowerettes are from Fil Tire’ and Fancywork Elements collection by Suzanne Sawko and me. They mimic the smocked flowerettes. I would be happy to share these designs with readers. After its 15 minutes of fame from the magazine ads and manual covers, the dress was loaned out to the granddaughters of several friends. Then my own granddaughter, Laurel Cade, wore it to a wedding. And like the Timex watches, it takes a lickin’ and keeps on tickin’. Now, in near perfect condition it hangs in the nursery closet as I hope for one more granddaughter. The smocking follows my personal preference for bishops smocked deeply in the front and back with fewer rows at the shoulder. I usually pleat as many rows as I possibly can, though the lower rows across the shoulder pleat very irregularly due to the armhole curve. But these rows will not be smocked so I just keep cranking the pleater across these difficult areas. At this point, I examine the pleating and determine how many rows will be smocked at the shoulder. If 10 rows are pleated, the peak of the bottom wave will sit on that row at center front. 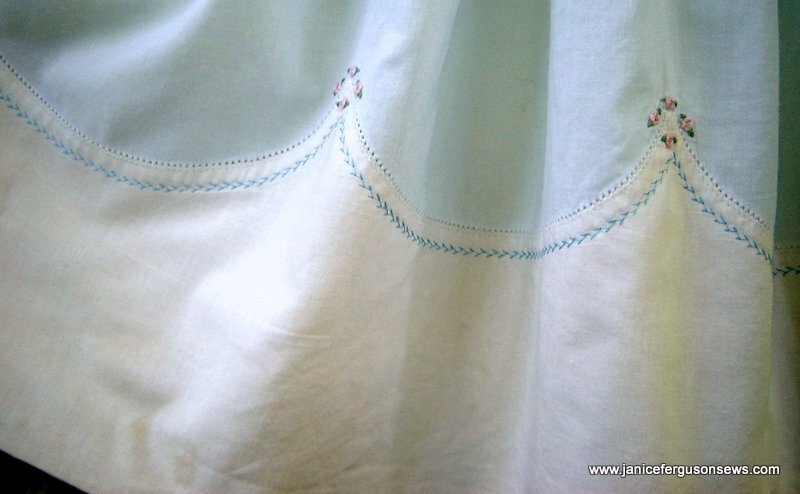 Planning to smock 4 rows across the shoulder, I know the smocking must stagger waves up the front to row 4 at the sleeve seam. It would be easy enough to graph this out, but I don’t graph unless the need is great. So usually I just sit down and begin smocking the wave at center front on the 10th pleating thread. I eyeball the distance and guestimate how many and how deep the waves must be for me to reach row 4 at the sleeve seam. Usually, I have to redo this once or twice. But it is only one half of the front so it doesn’t take long. After I have one half of the front successfully smocked to the sleeve seam, I repeat this pattern on the other side of the front. Then the upper rows are filled in with more waves and diamonds. The pattern is worked across the sleeves and down the back. Sometimes, I just continue the 4 rows (or however many I have smocked) across the back and eliminate the deep V at center back. 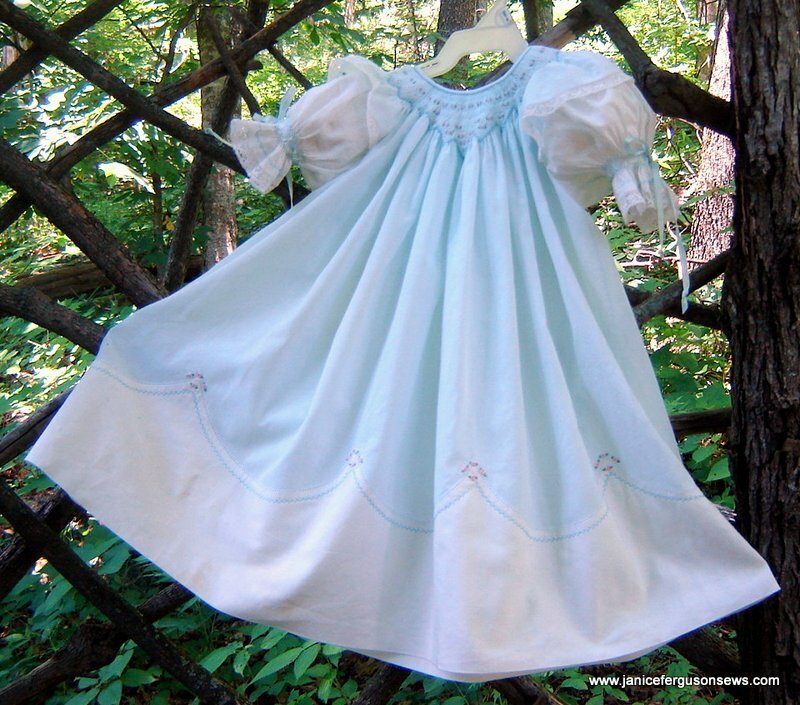 I brought this dress with me to our cabin in the mountains of North Carolina so I could photograph it for the blog. But when we return home, it will be hung once again in the nursery closet awaiting its next life. If you would like the machine embroidery rosette designs, post your request as a comment. I won’t be able to send them out until I get home but will do so as soon as I can. 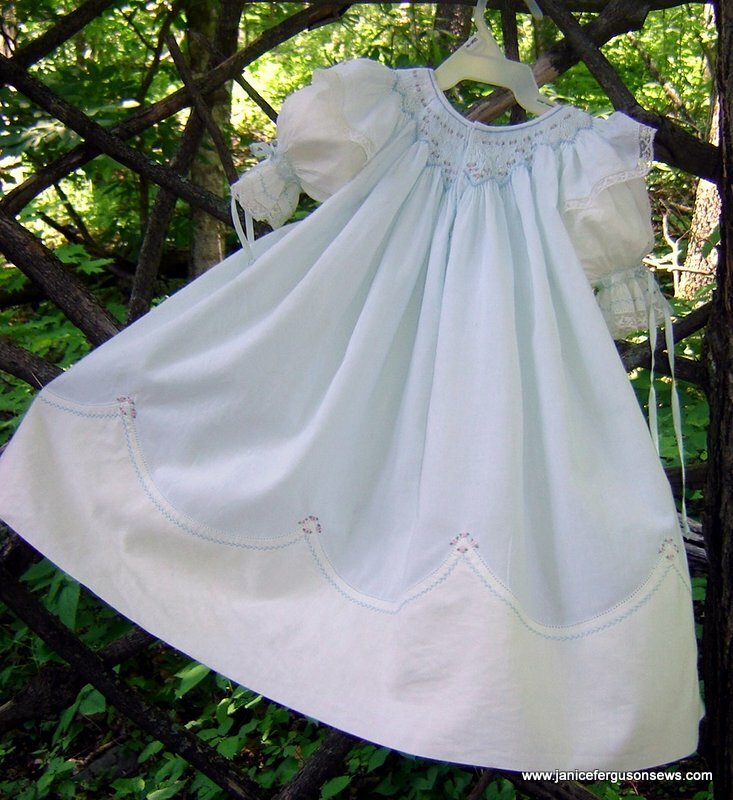 This entry was posted in girls, heirloom sewing, machine embroidery, Madeira applique, smocking, techniques. Bookmark the permalink. Suzi, the designs have been sent. I hope you enjoy stitching these out as much as I have. You can use them on so many projects. Happy sewing on your wonderful Brother machine! Somehow I ended up on this post today. And I’m so glad I did! I thinks this is the most gorgeous dress I have ever seen!!! I would love the ME files sent to me. 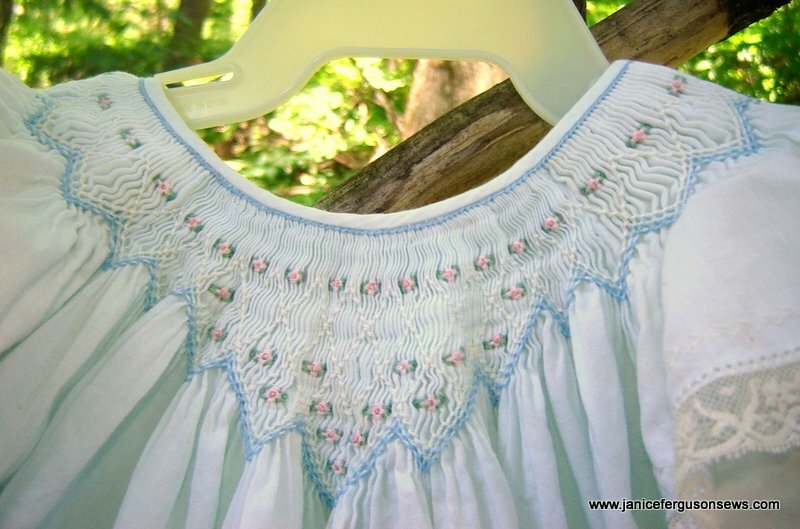 Have you considered making a pattern for the smocking plate? I’m a beginner smocker and not sure I could figure this out on my own. Gina, I’m glad you ended up here, too. The designs have been sent but I’m still searching for the blog post that gave basic instructions for creating tapered smocking designs. What a gorgeous dress! I have been searching for some flowerettes similar to these and would love to know where to purchase them if still available! Love your site! Thank you, Megan. I’m away from home away from my computer. This device does not show me which post you saw. If you will let me know in which post the flower states caught your eye I will try to be more helpful. That dress is just beautiful! I would love the file if it is still available! Thank you, Allison. The designs have beem sent. I hope you enjoy stitching them. This dress is exquisite! 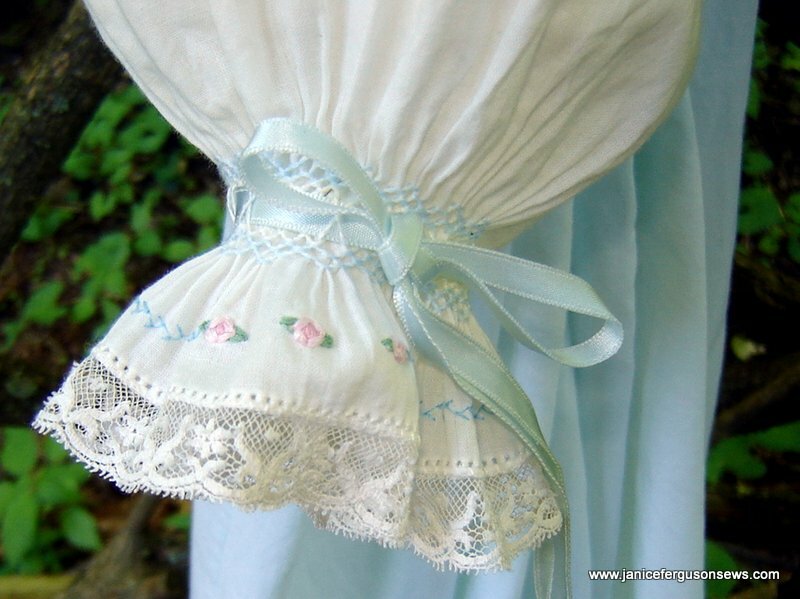 I’m just learning smocking, and expecting my first grandchild but would love to work my way up to this. Any files, patterns, tips, you have would be hugely appreciated. Do you have any suggestions for a good preliminary project? Thank you for your help! Phyllis, thanks for your compliments about this dress. It is one of my all-time favorites and it was a pleasure to make. I would suggest you begin and practice on a bishop dress with the angel sleeves over a regular puff sleeve. After you cut and seam it up, you could then try the Madeira applique’s hem, which is surprisingly easy but is better with some practice. Then Madeira hem could be finished with a simple machine made feather stitch, though pinstitch is my favorite. Again, it is not hard, but improves with some practice to learn the pattern of the stitch and see just where you need to pivot (that would be on with the left swing of the needle in the skirt fabric after the wing penetrates the contrasting hem. You will need a cotton batiste for the pinstitch to look good and for the Madeira hem to turn nicely. A polycotton would pose a number of challenges with no guarantee of satisfactory results. Finally, the machine embroidery design files for the hem and sleeves will be sent to you whenever you ask for them. So you will need: blue (or pink or whatever color) cotton batiste for the basic bishop skirts and sleeves, white or ivory lace edging for the angel sleeve caps and the sleeve edges, white or ivory cotton batiste for the angel wings over the sleeves and for the Madeira applique hem, a wing needle, colored thread for the embroidery, and a wing needle if you choose to pinstitch. The designs were digitized for 50/2 DMC cotton machine embroidery thread or 60/2 Mettler cotton machine embroidery thread. I’ll send the designs to you now. Again, you will get better results if you “rehearse” the designs, especially to get perfect placement at the peak of the Madeira hem and on the sleeve ruffles. Good luck! I’d love to hear about your progress. I’m sorry for the delayed reply, but our 4 yo granddaughter was here for the last 3 days and I did nothing but play with her. Pure joy! Thanks for your compliments about this dress. It is one of my all-time favorites and it was a pleasure to make. I would suggest you begin and practice on a bishop dress with the angel sleeves over a regular puff sleeve. After you cut and seam it up, you could then try the Madeira applique’s hem, which is surprisingly easy but is better with some practice. Then Madeira hem could be finished with a simple machine made feather stitch, though pinstitch is my favorite. Again, it is not hard, but improves with some practice to learn the pattern of the stitch and see just where you need to pivot (that would be on with the left swing of the needle in the skirt fabric after the wing penetrates the contrasting hem. You will need a cotton batiste for the pinstitch to look good and for the Madeira hem to turn nicely. A polycotton would pose a number of challenges with no guarantee of satisfactory results. Finally, the machine embroidery design files for the hem and sleeves will be sent to you whenever you ask for them. 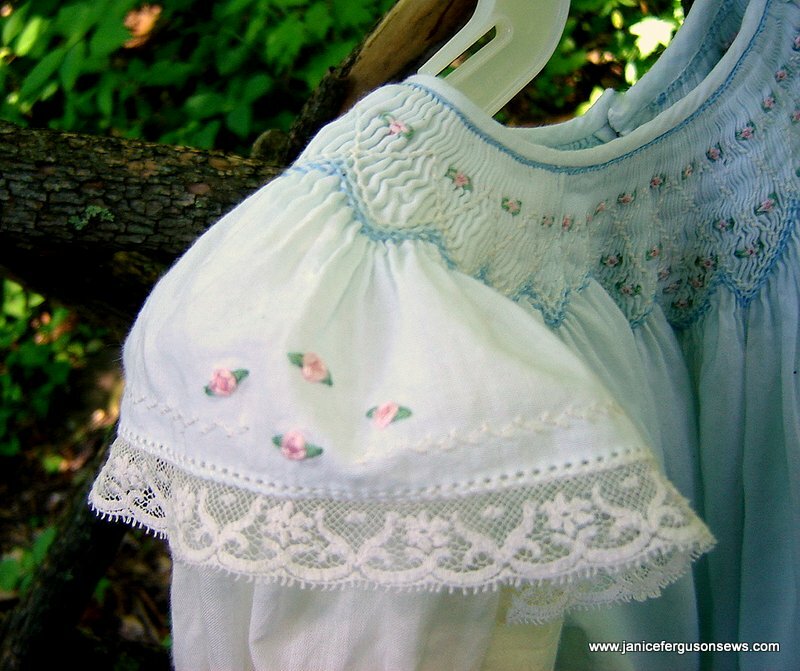 So for this dress you will need: blue (or pink or whatever color) cotton batiste for the basic bishop skirts and sleeves, white or ivory lace edging for the angel sleeve caps and the sleeve edges, white or ivory cotton batiste for the angel wings over the sleeves and for the Madeira applique hem, a wing needle, colored thread for the embroidery, and a wing needle if you choose to pinstitch. As for embroidery threads, my personal preference is to use these cotton threads for these designs, 30 wt. for the leaves and 30 or 50 wt. for the flower centers and petals. But it works with regular 40 wt. embroidery thread. I’ll send the designs to you now. Again, you will get better results if you “rehearse” the designs, especially to get perfect placement at the peak of the Madeira hem and on the sleeve ruffles. Good luck! I’d love to hear about your progress. The pinwheel rose files are attached. My personal preference is to use cotton thread for these designs, 30 wt. for the leaves and 30 or 50 wt. for the flower centers and petals. But it works with regular 40 wt. embroidery thread. I hope you enjoy using them and will visit my blog again. I have offered several similar designs that emulate hand embroidery. Happy sewing! Thank you, Julia, for your very kind comments. I have replied to you privately and hope to be able to help you with this wonderful project.